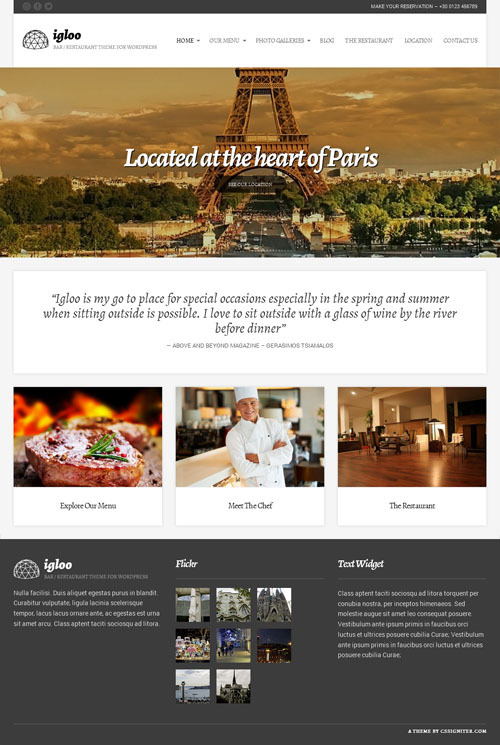 Igloo is a beautiful WordPress Theme that is perfect for restaurant, cafe, bar, coffee shops, fine dining, sushi restaurant websites. Igloo uses the powerful Foundation grid and adapts to every screen size. This Restaurant Theme is about promoting your content, not its design elements and keeping it simple achieves just that. You don’t need any programming knowledge to create your restaurant website. Igloo Restaurant Theme features a responsive design, full screen slider, food menu cards, google map integrated, social media integrated, photo galleries, testimonials and more.